Hitachi to showcase live production broadcast solutions at IBC. 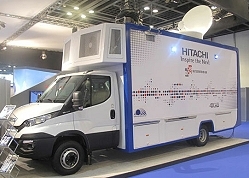 Istanbul, July 2016: Hitachi Kokusai Electric is to demonstrate its broadcast system solutions at this year's IBC to include its professional video camera systems; its OB-BOX concept, as well as its mobile transmission vehicles and the latest developments in broadcast antenna systems. On show will be its Live Production OB-Box equipped with the company’s new 4MOS sensor technology 4K production camera; 3MOS 1080p sensor SK-HD1300 series cameras; and 3CCD sensor SK-HD1200 production camera with the company’s new 7.4 inch OLED viewfinder. First introduced to the European market at IBC last year, OB-Box is proving popular amongst broadcasters and OB service providers across Europe, the Middle East, Africa and Asia regions. OB-BOX is a fully featured modular OB facility which is delivered to the customer and then mounted onto a vehicle’s chassis using a proprietary fixing kit. This approach reduces the manufacture and delivery time in any market worldwide since it removes the need to source and ship an appropriate vehicle for each customer. Another example of Hitachi’s Kokusai Electric’s conceptualization and development capabilities is the company’s Mobile Transmission Vehicle. Designed to enable a broadcaster to get to the news scene and quickly establish links back to the production centre, the off-road vehicle features an on-board Pals PKM-120Ku Band antenna, and Hitachi’s Z-HD6000 3MOS sensor Camera with wireless connectivity capabilities. “At our Istanbul design and manufacturing facility we can conceptualize and supply any broadcast production system from field-based ENG teams to fully featured digital production studios, terrestrial transmission networks and satellite earth stations,” commented Cemal Yilmaz, General Manager of Hitachi Kokusai Turkey.